Teach your child that every action has a consequence using the testimony of Moses as he journeys through the wilderness. 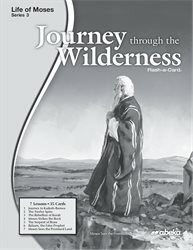 This lesson guide (already included in Journey to Wilderness Flash-a-Card and Bible Stories) will help you as you teach 7 Bible stories that tell of the Israelite’s consequences from murmuring at Kadesh-Barnea to some not being able to enter the Promised Land. Use this lesson guide to find content to teach, prompts for when to use the pictures, and review questions for each story.